With NHTSA's closure of the investigation into the Chevy Volt, General Motors is now trying to rebuild the plug-in hybrid's image. But a new stumbling block has appeared on the road to higher sales — dealers turning down Volts from GM. General Motors sold only 7,671 Volts in the United States in 2011, well short of its 10,000-unit target for the first year. GM spokespeople have attributed weakness in demand to the National Highway Traffic Safety Administration's investigation into the risk of fires in the car's battery pack. But I'm not entirely certain that can all be blamed on that considering the weakness in sales existed well ahead of the NHTSA investigation. Now we're hearing reports of dealers who don't want to buy the cars from GM because customers just aren't materializing for the Volt. Automotive News gives an example this morning in the New York City market where last month, GM allocated 104 Volts to 14 dealerships in the area and dealers took just 31 of them, the lowest take rate for any Chevy model in that market last month. That group of dealers ordered more than 90% of the other vehicles they were eligible to take. But the New York area — with its well-documented electric car infrastructure problems — isn't the only place dealers are saying no to GM. In Clovis, Calif., Brett Hedrick, dealer principal at Hedrick's Chevrolet, sold ten Volts last year. But in December and January he turned down all six Volts allocated to him under GM's "turn-and-earn" system, which distributes vehicles based on past sales volumes and inventory levels. 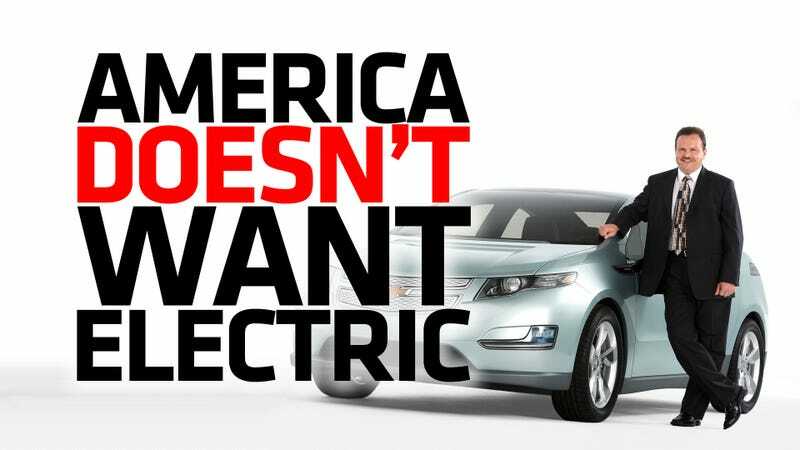 GM's "thinking we need six more Volts is just crazy," Hedrick said to Automotive News. "We've never sold more than two in a month." Hedrick says he usually takes just about every vehicle that GM allocates to him. But, dealers so far admit that GM isn't trying to ram the Volts down their throats — instead they think there are likely other regions that will pick up the slack in demand. I don't know where those regions might be, but they've got to exist, right? This comes a week after GM execs told us in the media that they would no longer be aiming to meet their initial Volt production target set for 2012 of 60,000 units globally and 45,000 units of which would be for U.S. sales. Instead they've vowed simply to build as many as customers want. Well, if that's the case, maybe they might need to think about cutting some production — because the dealers seem to be saying that Americans just aren't ready for an electric savior quite yet. OnStar Phone App Officially Makes Chevy Volt The "Jesus Car"
Research seems to indicate that too. Bloomberg tells us this morning that consumers, citing price and questions about unproven technology, are growing less likely to be interested in buying a plug-in vehicle, according to a survey released this month by market-research firm Pike Research of Boulder, Colorado. In that 2009 survey, 48% of respondents said they would be "very" or "extremely" interested in buying a plug-in vehicle, Pike Research said. In 2010, 44% said they were in those categories, and at the end of December of last year that figure fell to 40%. Hmm, I feel like I've read that somewhere already.